Sun Green Dye Sublimation Ink is 100% purified dye ink with independent purification technology andhas an excellent color expression especially for bright shade and real black. 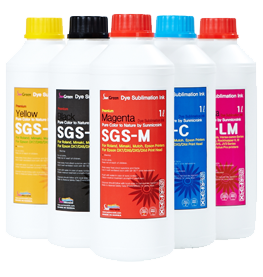 SunGreen Dye Sublimation Ink is designed for a high performance digital textile printing ink. It delivers vivid and bright deep color into fabric through heat sublimation. Based on high disperse technology and accumulated production experience, SunGreen Dye sublimation ink has excellent ink flowing and long lasting stability that does not make any clogging. 100% Purified Dye Ink by independent dye purification technology. Excellent color expression especially for bright shade and real black. Optimized Ink adhesion on materials and faster Ink dry. Free of any hazard materials such as Pb, Cd, Hg (RoHS compliant). Environmental Friendliness with no smoke, smell and allergic reaction.